corner of the lap into the finish straight. Photo by Sylvia Turner. 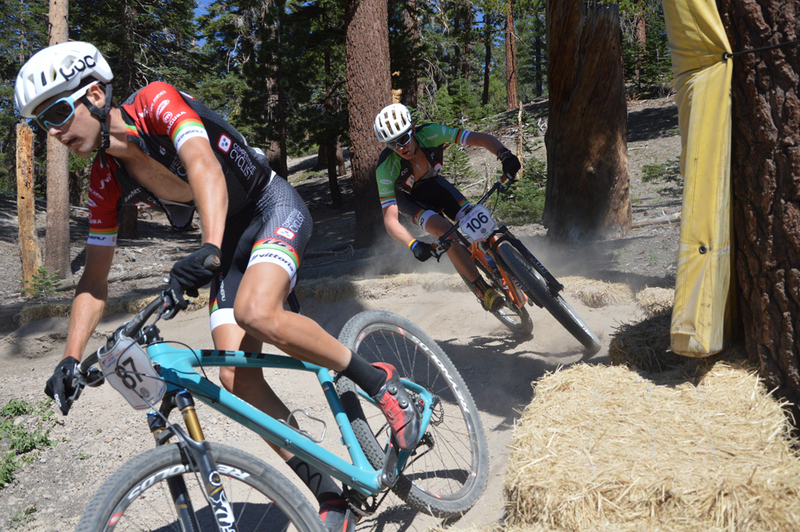 This past week, athletes from Summit Bike Club (based in Park City, UT) competed at USA Cycling National Championships in Mammoth Lakes, California. SBC started in 2012, and now has over 80 members, including some of the best junior mountain bikers in the country. Most mountain bike races are between 60 to 90 minutes on a cross-country style course, with difficult climbs, fast descents, and tough obstacles. The race course at Mammoth consisted of a fairly smooth and gradual climb and ended with a bumpy, technical descent into the finish. Each lap was four miles long with 818 feet of climbing each lap and a starting elevation of 8,329 feet. It was sure to be both fun and challenging for the athletes. Day one on Wednesday, July 15, started with Ellise Shuman (16, Sandy) and Amber Raby (17, PC) in the Junior 15-18 Cat2/3 Womens category. With a great start, Ellise stayed with the lead throughout the race that ended in an exciting sprint to the finish line. Both Ellise and Amber came out with personal bests with 2nd and 11th, respectively. In the second race of the day, Mike Turner (48, PC) came through the finish in 24th for the Cat2/3 45-49 Men. The next set of races was the short track. At Nationals, the short track course is only three quarters of a mile, and is timed with 20 minutes of racing plus three laps. Two athletes competed for the first Category 1 National title in the Women’s 17+ category. Rachel Anders (17, Sandy) and Lia Westermann (17, SLC) finished 4th and 7th, respectively. Day two on Thursday, July 16th was the main day of racing for Summit athletes, with three athletes in the U23, four athletes in the Cat1 Jr Women, 10 athletes in the Cat1 Jr Men, and three athletes in the Jr 13-14. The athletes that compete in the U23 wave typically race against the nation’s top professionals during the regular season, but get their own race during Nationals. Mike Sampson (21, New Hampshire), Matthew Turner (20, PC) and Jason Christiansen (19, Lindon) were the hopefuls for Summit. Mike and Matthew were able to grab spots on the second row at the start, while Jason in his first race at this level, was in the last row in a field of 35. Mike was able to hold on in the top 10 until the penultimate lap where he was affected by back cramps but still managed to hold out for 13th. Matthew finished strong to end in 16th and Jason finished in 26th after five laps. The second wave of the day featured Rachel and Lia again in the 17-18 Women’s category followed by Sienna Leger Redel (16, PC) and Anika Heilweil (16, SLC) in the 15-16 Women’s category. The 17-18s were off the line first, and Rachel and Lia held positions in the top 10. The 15-16 girls followed, with Sienna and Anika in pursuit. Rachel took hold of 2nd place early and held the position to the finish (Park City’s Haley Batten took home the gold). Lia looked strong in 6th and was making up ground on 5th in the 3rd and final lap, but it just wasn’t enough distance to close the gap. Sienna was fast off the line into an early lead but was plagued with breathing problems in the first lap and had to pull out of the race. Anika pushed through and finished the race in 10th. Then it was the Junior Cat1 Men, with a big field of 10 Summit riders. Connor Patten (16, PC), Cameron Larson (16, Pleasant Grove), Tommy Fendler (16, PC) and Estin Hicke (16, PC) in the 15-16 age group. Danny Fendler (18, PC), Jacob Sacket (18, Texas), Adam Brown (18, Orem) Nick Loyola (17, Holladay), Matthew Behrens (17, PC) and Zach Calton (18, Ogden) in the 17-18 age group. The 17-18s were first off the line followed again by the 15-16s each on course for four laps. Danny had a breakthrough race and finished just out of the top 10 in 11th. Jacob finished 22nd, Adam finished 29th after fixing a quick flat, Nick in 32nd, Matt 34th, and Zach in 46th after a hard crash in the first lap. In the 15-16s, Connor was with the lead group from the start, and put in an amazing effort to finish in 3rd. Cameron was 20 seconds off the podium in 6th, Tommy finished 17th, and Estin did not finish after having mechanical problems in the first lap. The final waves of the day were the 13-14 boys and girls. Skylar Patten (14, PC) and Martin Anders (13, Sandy) were in the boys field, and Mila Leger Redel (14, PC) was Summit’s only athlete in the girls’ field. Off the start Skylar was on the tail of the leader, and making up ground at the last lap of their shortened course. Skylar finished in 2nd, just 10 seconds off the top step, and Martin finished in 21st place. Mila was off the line into the top ten early in the first lap and continued to make up ground to get into the top 5 during the race, but got passed in the last lap to finish just one place off the podium in 6th. Beyond racing, the team also enjoyed visiting Yosemite National Park to see Half Dome, El Capitan, and go on a quick hike during an off day. Congratulations to Utah pros Keegan Swenson and Alex Grant on their respective 2nd and 3rd place finishes in the elite race, as well as the other Utah junior cross-country riders including: Jon Jon Drain, Drew Palmer-Leger, Anders Johnson, Hayden Sampson, Katie Clause, Lauren Bingham, Haley Batten, Kira Crowell, and Sydney Palmer-Leger. After a successful weekend of racing at Nationals, Summit athletes prepare for the upcoming NICA High School season, Collegiate racing, and possible World Championships in Andorra. Thank you to all our coaches and parents who have supported all the athletes throughout the season and thank you to our awesome sponsors who make this all possible, especially Competitive Cyclist, Pivot Cycles, and Dr. Sumsion/PC Orthodontics.